This game is for two players and has a split-screen interface. The players are not meant to see each other's screens, but should instead communicate verbally in order to navigate the level and stay alive. 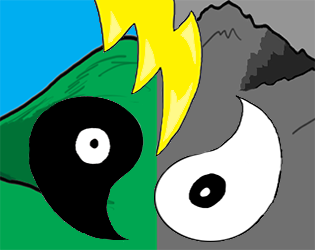 A co-op game for two players, who take on Yin and Yang, the complementary sides of the Chinese taijitu symbol, as they attempt to reunite and restore balance. With one player controlling movement (left arrow and right arrow) and another controlling jumping (space bar), the two sides move in unison in separate worlds, traversing traps and obstacles on their way.